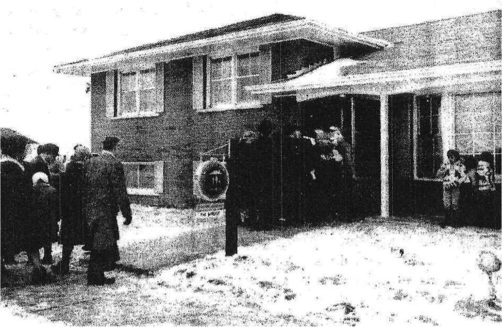 On a cold weekend in February, 1963, 12,000 people lined up for a look at six model homes being advertised in a new subdivision in Northern Etobicoke called Albion Grove Village... the first “all electric” subdivision in Ontario. Open house at 136 Stevenson Drive in Albion Grove Village, February 1963. Newspaper source unknown. Five years earlier, in 1958, there had been an all-electric model home on display at the CNE and, after that, homeowners were eager to learn more about this new world of “living better, electrically”. Developed by Jobert Construction, Albion Grove Village would extend north and east for many blocks from the model homes on Stevenson Drive and Seguin Court to become the largest all-electric subdivision built in Metro Toronto. Homes were priced at $15,000 to $19,000, depending on the model. Opening ceremonies were held at the Hydro’s mobile display trailer, brought there for the occasion. Present were the Ontario Minister of Labour, the Chair of Ontario Hydro and the Reeve of Etobicoke. Also attending was Garfield Ella whose farm was being subdivided to build Albion Grove Village and after whom Garfella Drive in the subdivision is named. 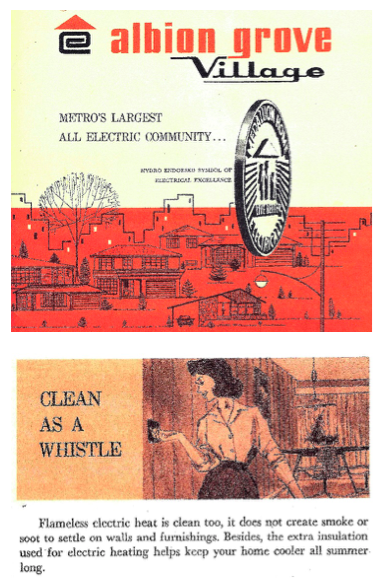 In 1957 Ontario Hydro had set a goal to increase the number of all-electric homes to one million by 1970. They initiated a program of conferring “Medallion” status on homes that met specific criteria: 100 amp electrical service; electric heating; at least one electric appliance installed and prewiring for four others; an electric “Cascade 40” water heater; a minimum of six inches of insulation in the roof and three inches in the walls; and double-paned aluminum storm and screen windows. In addition, the entire subdivision had buried wiring. To certify that a home was truly “all-electric”, a doorbell unit was installed that included a round black and white medallion reading “Medallion All-Electric Home – Live Better Electrically”. I was also lucky to find one of the sub-division’s original owners, still residing at 4 Seguin Court. Anna Mrowietz still had her copy of the original sales brochures and kindly loaned then to me so I could take some photos. Today, “Living Better Electrically” has different connotations as we watch hydro prices climb and search for “green” sources of energy that will not break the bank. Albion Grove Village is a reminder of how much our attitudes towards hydro electricity have changed over time. Researched and Written by Denise Harris.